A return to form for the franchise,with Donald Pleasence back once more,and a very new introduction to a very young Danielle Harris,who is a scream queen now in her own right,starring in two Hatchet films, See No Evil 2, Stake Land to name a few. After a 8 year absence from the franchise Michael returns once more,to inflict more pain,misery and death on his home town Haddonfield. This time with news of a Niece,he would like to meet,and well not take out for lunch, but the taking out part he certainly wants to do. Dr Loomis is back to try his best to capture Michael once and for all. With both surviving the explosion from number 2. And Jamie being the Daughter of Laurie,who is being looked after by foster parents,for reasons unknown. We have a very similar film to the first one,with Jamie having to survive the night with the help of her babysitter,with a relentless Michael determined to finish off all existing family members. Directed by Dwight H Little with no involvement this time from John Carpenter,the only mention he has in this film is, based on Characters created by John Carpenter,and Deborah Hill. This is the last decent film in the franchise,with 5&6 not being the best. The film is a decent return to form for the franchise,with decent kills,and a decent amount of tension,with an excellent performance from Danielle Harris as the young Jamie. 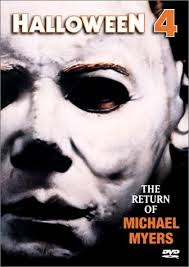 This film is what the fan base wanted after the worldwide disappointment of number 3, then again a saying is,be careful what you wish for,as it might come true,as we had three more Halloween films,with this being Okay,and the other two diabolical. We had to wait until 1998 till we had a decent Halloween film again called Haloween H20. Staring once more Laurie Strode,as Jamie Lee Curtis returns.